A Vice Sports documentary about Nike’s eventually successful entry into the skateboarding market. In conjunction with Nike’s 15 Years of SB Dunk campaign and celebration Vice Sports has just released a short, in-depth documentary detailing the shoe’s meteoric rise in both skateboarding and popular culture. The story covers everything from Nike’s first unsuccessful attempt at penetrating the industry via the Air Choad in 1996, all the way up the mid 2000’s streetwear and hypebeast craze that created full-on resell markets, shops, and subcultures completely dedicated to SB Dunks. Much credit for the successful seeding of the Nike SB program and Dunk legacy goes to first team manager Robbie Jeffers and his vision to enlist evergreen and street accredited skateboarders, not just “flavor of the month” ambassadors, as he puts it. Riders like Richard Mulder, Danny Supa, Reese Forbes, and Gino Iannucci became the revamped plan’s core squad. 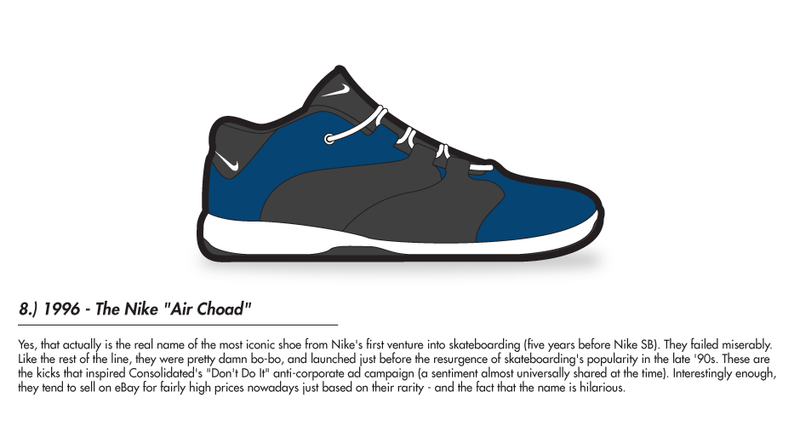 Then came the strategy of skate shop-centric regionalism and releases, as well as artist-based, limited-edition collaborations—the tipping point that catapulted the shoes into a highly-coveted stratosphere where non-skaters wanted to have them just as badly, if not more, than skaters wanted to skate them. It was truly the perfect storm of disruptive marketing genius. The rest is documented history, in this case, with archived footage and recent commentary from current Nike SB riders like Paul Rodriguez, Theotis Beasley, Eric Koston, Brian Anderson, Ishod Wair, and more.